New 2015 Phino rims: PW10 EPIC, PW12 T.K.O., PW14 MEGA, PW16 NOVA. PW48, PW58, PW68, PW78, PW18A/PW18B, PW28, PW38. PW88, PW138, PW108, PW14A/PW14B, PW118. It’s not easy being a small and relatively new name in the custom wheel business, but Phino Wheels is clearly dead set on making their presence known. They’re doing an admirable job of it so far, offering up a wheel line that dishes out tough-as-nails looks with top quality performance. Their styles offer something for everyone, with some styles being more traditional than others, but all of them are worth taking a look at. For drivers who want to stay low-key (but not boring), there are rims such as PW14 MEGA, PW16 NOVA, and PW10 EPIC. These new wheels have classic designs with a modern feel- PW14 and PW16 have clean-cut lines, and PW10 features forked spokes with a high-style look. With these rims on your ride, you’re sure to get plenty of attention and look classy while doing it. To get a little more wild, check out wheels such as PW68, PW48, and PW88. These styles get a bit more daring with their designs. PW68 has a fanged look, with an aggressive and spiky design. PW48 and PW88 take the forked spoke style and give it a flashy, updated twist. No matter what your tastes are, if you want original-looking rims with tons of street style, Phino is definitely worth checking out. To see all of Phino’s wheel options: Phino Wheels. 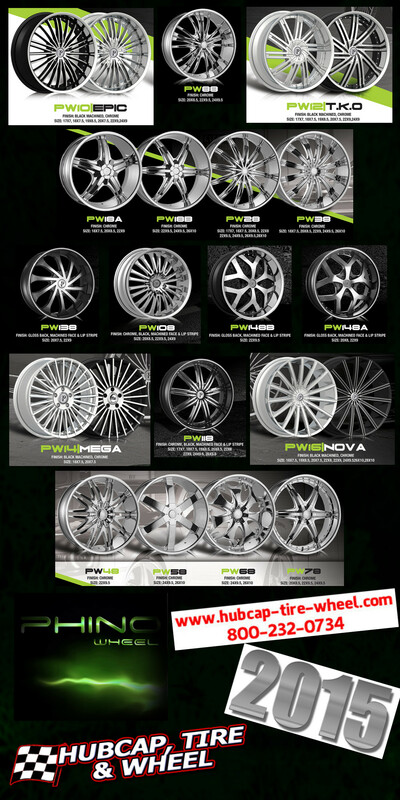 To order Phino rims for your ride, call us at 1-800-232-0734. We have a team of wheel and tire experts with decades of combined experience, and they can guide you to the perfect wheels and tires for your vehicle. It’s important to get the right fitment and our wheel and tire pros will help you get exactly what you need to take your ride to the next level.